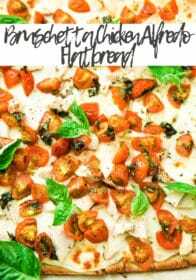 I teamed up with Divine Flavor to share this irresistible flatbread recipe. As always, all opinions are my own. Behold my new obsession…flatbread…or pizza or whatever the heck you want to call it. Truth is, I really do not know the difference between flatbread and pizza. I mean, maybe there’s some technical difference that I am unaware of, but I dunno, flatbread and thin crust pizza seem pretty much the same to me. 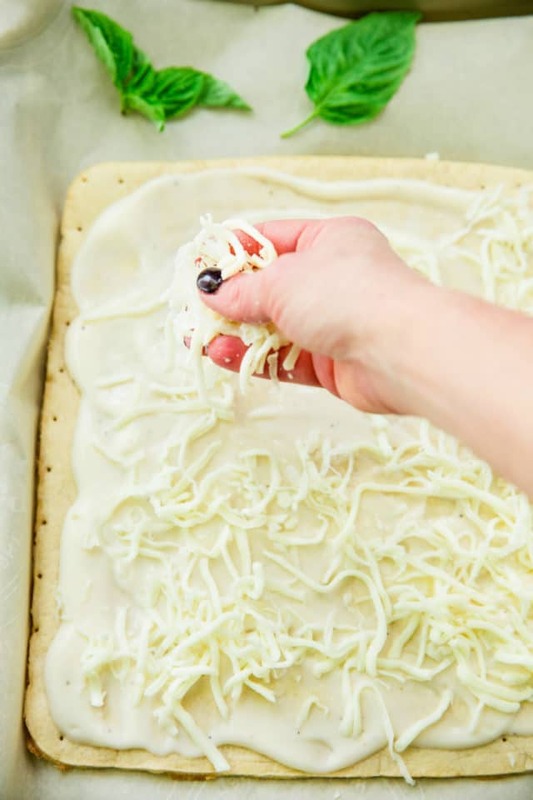 The only reason I’m calling this here recipe flatbread, is simply because it’s shaped in a rectangle and feels a little lighter than your typical pizza… so I’m going with it. 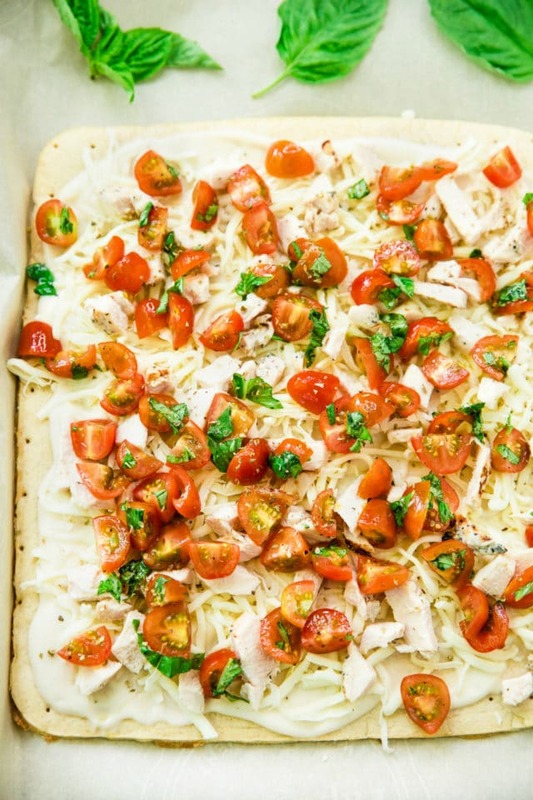 Bruschetta Chicken Alfredo Flatbread – let’s do this! This recipe starts with mixing up a quick + easy beautiful bruschetta. 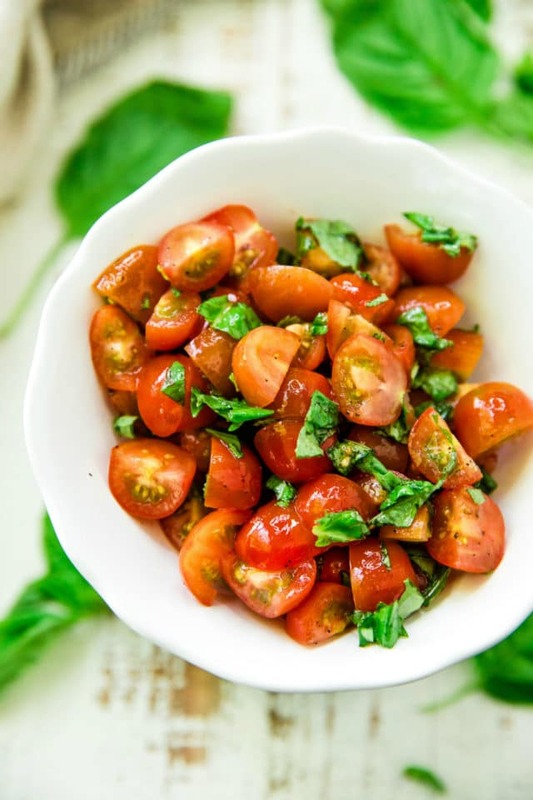 My bruschetta includes the classic bruschetta ingredients – tomatoes, basil, and olive oil. 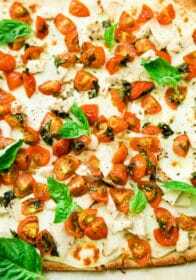 To make this bruschetta really shine, I used Divine Flavor organic grape tomatoes. Just look at how fresh, vibrant and gorgeous they are. Tasty too! 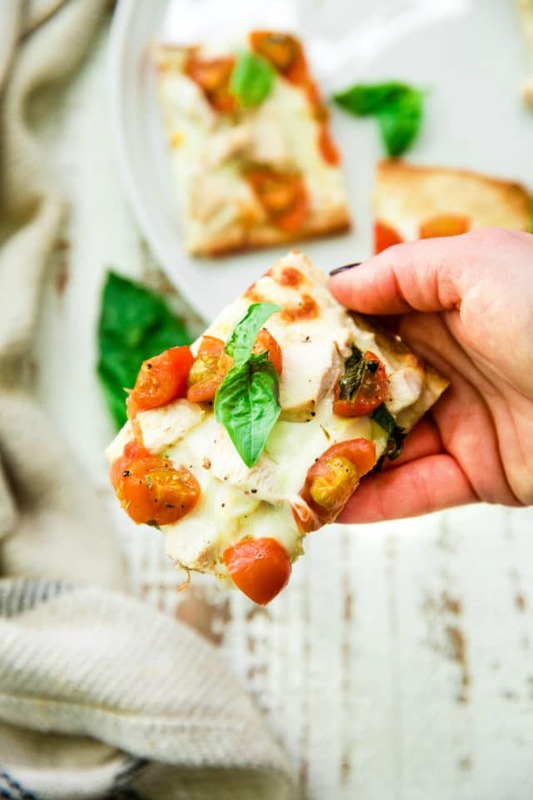 Divine Flavor grape tomatoes really are key in this bruschetta flatbread topping. You don’t want too much juiciness because this can lead to a soggy pizza, but you want a nice sweet flavor. These are perfect! 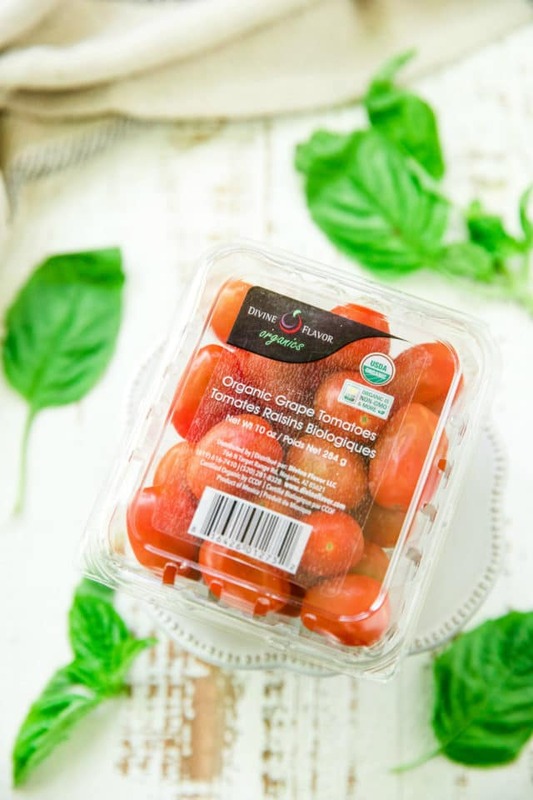 If you’re looking for garden-fresh, wonderfully delicious organic grape tomatoes as well as other varieties of fruits and veggies, even during the fall and winter season, you’ll definitely want to check out what Divine Flavor has to offer. When you purchase from Divine Flavor, you can feel good knowing they only ship and sell products that they would feed their own families. They follow the most rigorous food safety guidelines and state-of-the-art quality practices to offer a product that is the most flavorful, nutritious and healthy. I love that they use natural and improved agricultural methods to ensure healthier crops that are richer in nutrients and offer sustained shelf quality. You will taste and see the difference! So with this flatbread recipe, I kept things really easy and used a store-bought flatbread/pizza crust. The first step is to spread as much alfredo sauce (I used store-bought here too) as desired across the entire flatbread. Then top with your favorite cheese. 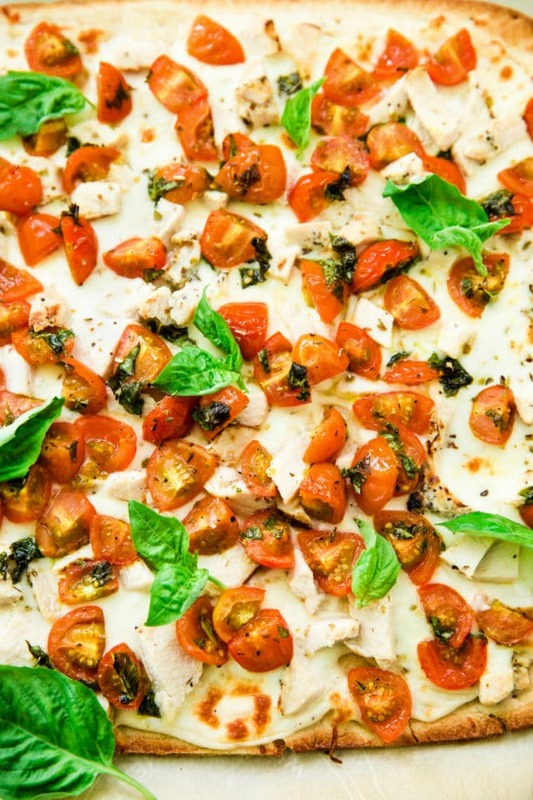 Shredded mozzarella or an Italian blend will work great for this recipe. I used light mozzarella cheese. Now, add on cooked chicken. 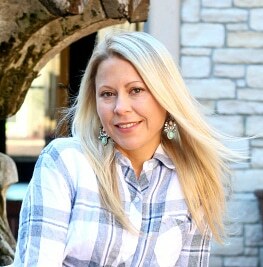 You can use rotisserie chicken or any cooked chicken you might have on hand. For a vegetarian option, you can simply leave the chicken off. Finally, top the flatbread with the star of this appetizer – bright and flavorful bruschetta. 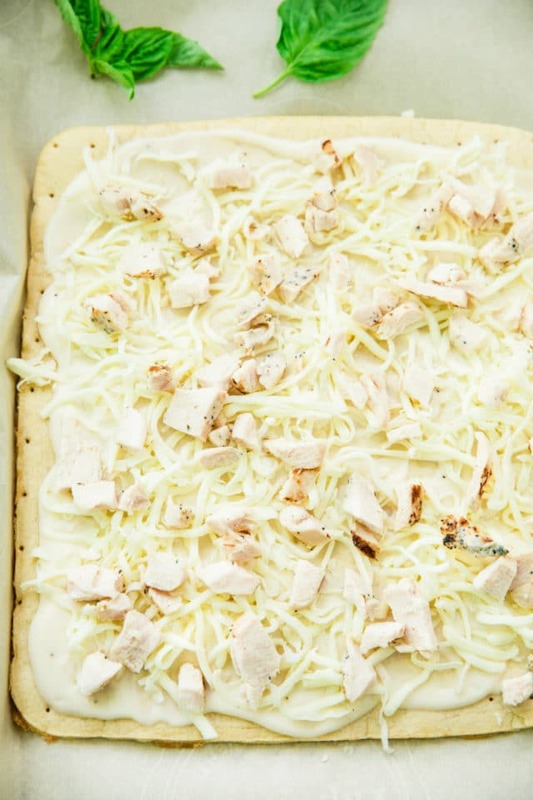 Bake the flatbread until the cheese is melted and the crust is lightly browned. You guys are going to LOVE this recipe! All of the flavors come together to create an amazing flatbread! 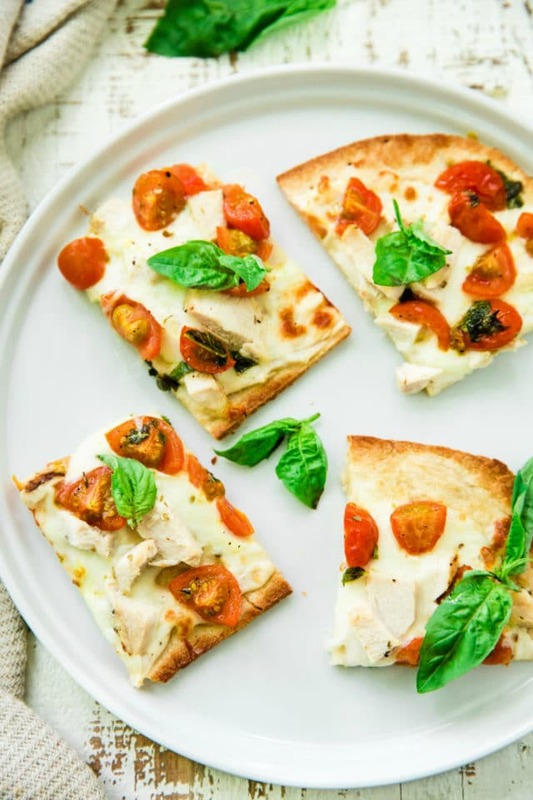 The best part of this flatbread/pizza recipe is that you can easily use convenience ingredients like pre-made pizza crust, alfredo sauce and even rotisserie chicken to get it ready in only 10 minutes! 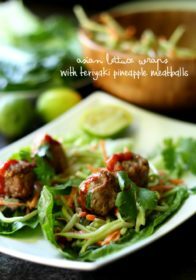 It’s so perfect for those crazy busy nights where you are thinking of take-out versus making dinner at home. Or when you’re entertaining and you don’t want to be stuck in the kitchen all night. 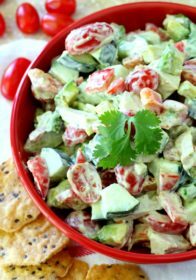 Looking for other easy, super tasty appetizer ideas? Check out several other favorites below! Learn more about Divine Flavor here and get tons of recipe inspiration by following Divine Flavor on Instagram. 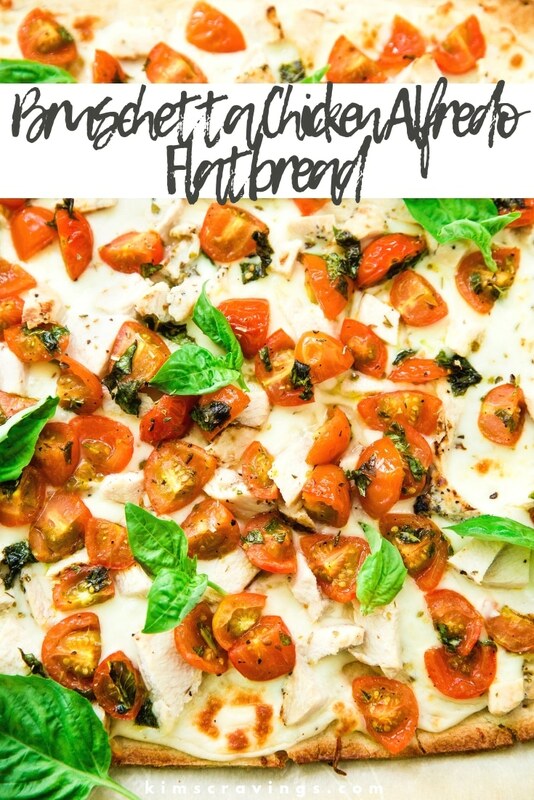 This Bruschetta Chicken Alfredo Flatbread recipe is so easy, crazy flavorful and perfect for serving during the holidays or for any get together because it's always a crowd pleaser! *I used about 7 ounces of the grape tomatoes. **This can be found near marinara sauce in the grocery store. You will likely only use 1/2 the jar or about 3/4 cup. 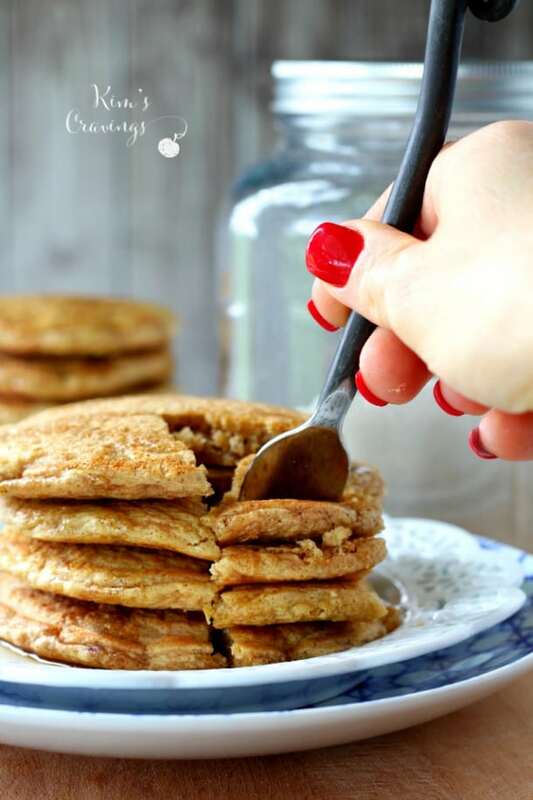 MAKE GLUTEN FREE: This flatbread recipe can easily be made gluten free by using a gluten free pizza crust. 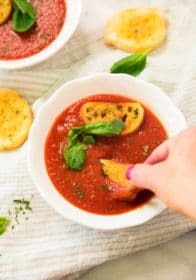 MAKE DAIRY FREE: To make dairy free, use a homemade dairy free alfredo sauce or substitute the alfredo sauce with marinara sauce and use dairy free cheese. MAKE VEGETARIAN: For a vegetarian flatbread, simply leave off the chicken. Looks like the perfect snack or great little party appetizer cut up into squares. This looks so amazing! Love that you used a store bought crust to make it even easier to get on the table! 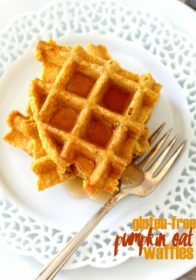 This looks delicious and yummy and my kids to love it. 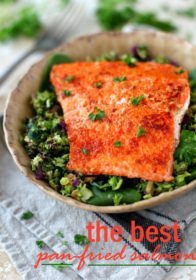 This is all of my favorite things in one recipe! I don’t think i’d share it with anyone! Genius. What do you cook the flatbread on ? This will be a great lunch one day while the kids are home for the holiday! ohhhh looks delicious! this is my kind of pizza! This looks so good. I love that you used alfredo sauce instead of regular sauce. YUM! 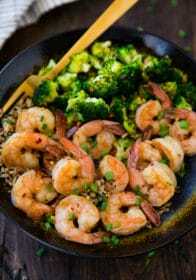 This would so good for dinner tonight. You can’t go wrong with chicken/tomatoes and Alfredo combo. Perfect comfort food for winter.